While artists and scientists, generally, take very different paths to become professionals, new evidence gives credence to the long-standing notion that the two careers may not be so different after all. 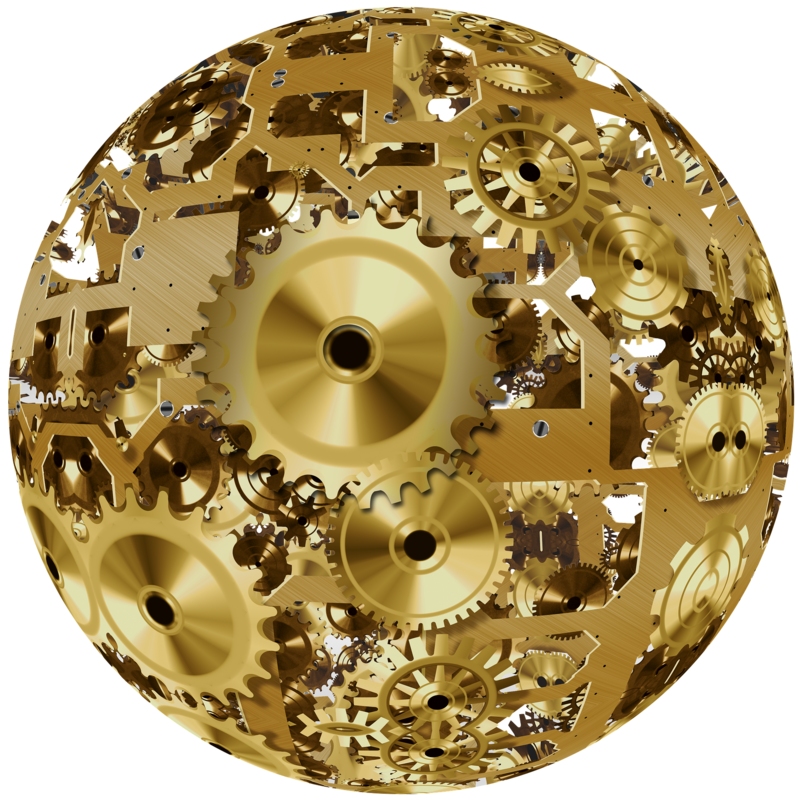 The results are the subject of a series of articles, this being the first of five, that suggest meaningful overlap and areas for potential partnership between the two careers. The need “to discover” captured half of respondents on both art and science lists, suggesting a strong common motivation in potential shared work. There is ample proof already that art can help science in packaging, narrative, marketing, perspective and relevance. For more than 50 years, the idea of artists and scientists working in combination has been a boon – most notably for consumer-friendly, emergent technologies, much like the tool used to write this article. For more complex issues – like climate change – can that same level of collaboration exist? Would it be mutual, substantive and credible? This is the central question for Broto, and the core of our Broto mission; to explore shared art-science work that addresses climate change. In some of the earliest meetings with our pioneering Broto artists and scientists, it was clear that the two professions are very different. Language is different. Goals are different. Perspectives different. Yet, because of other collaboration success stories, we know that, in combination, art and science can produce amazing outcomes. Broto’s theory, which this research seems to support, is that artists and scientists are more alike than not in key areas of motivation and priorities, which can provide the common ground for shared work. Is there yin-yang complementarity? The goal of Broto’s independent market research conducted in in February 2018 is to assess degrees of agreement between the two populations as foundation work to understand art and science collaboration. As one key area of inquiry, Broto wants to try to understand why artists and scientists are driven to do, respectively, art and science. Might professional artists and scientists be driven to these careers by common reasons? Is there any overlap? What, if anything, is the degree of disconnectedness? 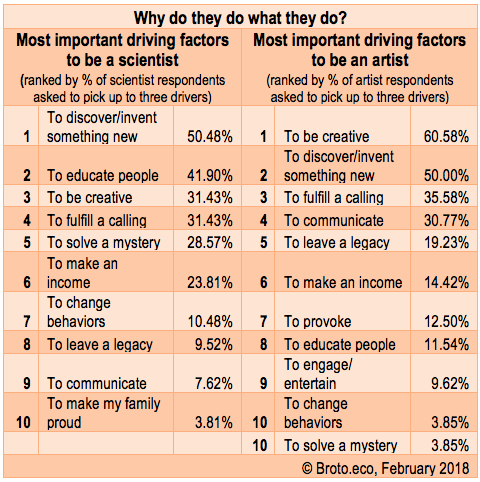 In separate, cloned surveys, the two groups were given the same roster of 15 “drivers” – terms to describe primary reasons to be artists or scientists – from which to choose the three most important factors in making their career choices. “To fulfill a calling”, which ranks third among artists (36%) and fourth among scientists (31%). In forging art-science collaborations, the initial focus should be on the common motivations between the partners. There are likely existing alignments to build on. Conversely, there are differing priorities to manage, leverage or delegate. Knowing what is most similar between collaborators might make early conversations about collaboration more productive. Likewise, knowing what is dissimilar might help in dividing tasks or using that mismatch to benefit the collaboration. If, for example, both collaborating artist and scientist can agree they want their shared work to be creative and focused on inventing something new, then they might have an immediate common goal. Additionally, they may sidestep discussions about education, mystery solving and communication as non-starters or not immediately relevant in making a productive partnership. It’s unknown whether such a mismatch would result in friction between collaborators, but the survey shows that these ideas are generally not strongly shared between the two respondent groups. As part of the question “What is the Most Important Driver?”, the survey allowed for open-ended comments. 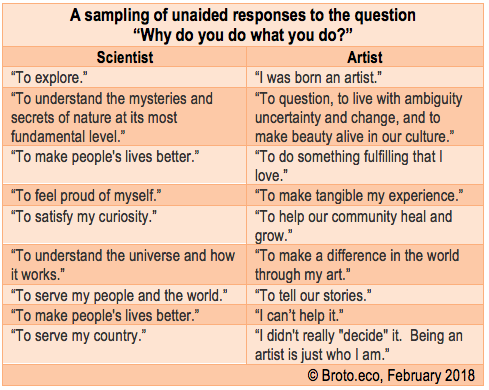 To summarize the unfiltered answers, it may be that scientists feel duty-bound in their career choice (“To make people’s lives better”), while artists feel their career choice was destined (“I was born an artist’). 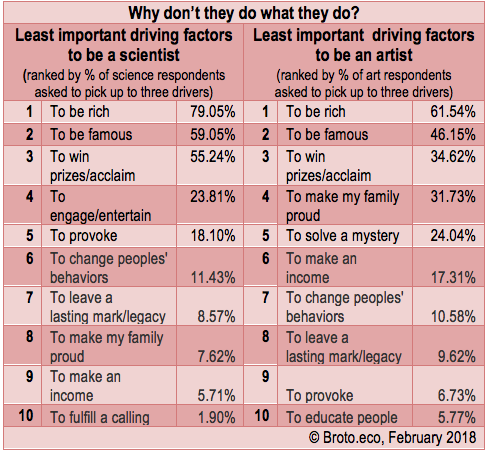 Broto also asked the respondents to pick their least important career drivers from the same lists – to help understand the non-priorities of each group. with scientists more internally aligned on the answers than artists. Neither group is interested in their fields for the money, the fame or the acclaim. In fact, artists and scientists independently rank those three terms the same way on lists of “Least Important Drivers”. “To make my family proud” ranks fourth among artists (32% of respondents) and eighth among scientists (8% of respondents) – meaning that scientists are more less likely to worry about what their family thinks about their career choices than artists. “To make an income” ranks sixth among artists (17%) and ninth among scientists (6%), which also ranks on the “most important drivers” lists, which we might read as confirmation of it being a more modest priority. “To provoke” ranks fifth as low priorities among scientists (18%) and ninth among artists (6%), suggesting that artists, more than scientists, are interest in get a rise out of audiences.